SEMCO INDIA - Manufacturer of Forgings in India-Manufacturer and Exporter of Carbon Steel, Alloy Steel & Stainless Steel Forgings & Machining of Components. Semco has successfully carried out Fabrication of Oil Tank Wagons for export to Senegal in the year 2003. 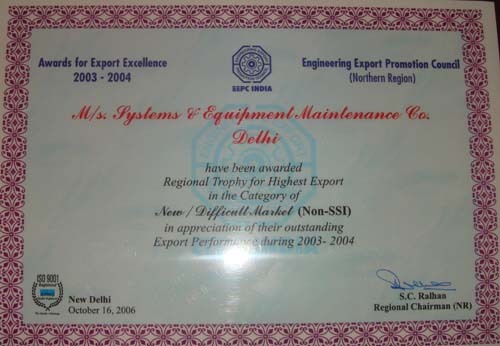 Semco has been awarded Certificate of Excellence for highest exports in new/difficult market by EEPC. 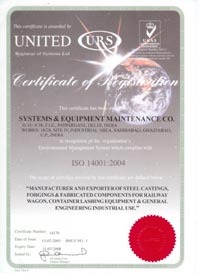 Semco has been recognized as Star Export House by Ministry of Commerce & Industry, Government Of India. Semco has undertaken huge orders for supply of Railway Wheel & Axle sets to Indian Railways. 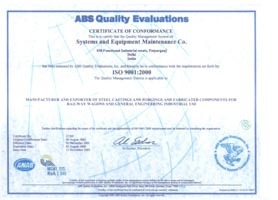 Semco has recently entered into Joint Venture with M/s CNR Datong Electric Locomotive Co. Ltd. for manufacturing Railway Wheel and Axle sets, Railway Rolling Stock, Forged and Cast Components. Presently company can supply around 15,000 Wheel Sets annually which will be increased to 30,000 Wheel Sets by year 2009.Company is aiming to pass AAR Certification for Railway Wheel & Axles in next 3 years.